As vezes é necessário abrir o terminal numa determinada pasta, que por acaso estamos trabalhando nela. Ora, em vez de abrir o terminal e navegar até essa pasta não seria melhor abrir o terminal logo nessa pasta? M4A is a popular digital audio format, most prolifically employed as the native format of iTunes. M4As can be either “lossy”, meaning they give up some audio quality to shrink the file size, or “lossless”, meaning they retain all the quality of, say, a Compact Disc. MP3 is the most famous and widely-used lossy digital audio format. By using the open source Sound Converter software, M4As can easily be converted into MP3 in Linux. Use your Linux distribution’s package manager to install Sound Converter and the necessary plugin (gstreamer0.10-plugins-ugly-multiverse) that enables MP3 encoding. Each package manager is different, but the following steps explain the process in Synaptic Package Manager, which is used by the very popular Ubuntu, as well as all Debian-based Linux flavors. If not running Ubuntu or another Debian-based distribution, skip to Step 5. When the program opens, enter “Sound Converter” in the Quick Search box. Sort the list of search results by clicking the “Package” header, then find “soundconverter” in the list. Click the checkbox to the left of “soundconverter,” then click “Mark for Installation.” If asked to install other required packages or perform other tasks to properly install the software, click “Mark,” “Apply,” or equivalent. Enter “gstreamer” in the Quick Search box. Sort the list of search results by clicking the “Package” header, then find “gstreamer0.10-plugins-ugly-multiverse” in the list. (The number in the file name can be different.) Click the checkbox to the left of “gstreamer0.10-plugins-ugly-multiverse,” then click “Mark for Installation.” If asked to install other required packages or perform other tasks to properly install the software, click “Mark,” “Apply” or equivalent. Click “Apply” in the program’s toolbar. Click “Apply” again in the dialogue box that pops up and Synaptic Package Manager will install the software. Run Sound Converter. When the program opens, click the “Add File” button if you want to convert a single file or a group of selected, specific files; click the “Add Folder” button if you want to convert an entire folder’s worth of files at once. Browse to and select the file(s) or folder you want to convert, then click “Open.” Your file(s) will be added to the conversion list. Click the “Convert” button in the program toolbar and Sound Converter will convert your M4As into MP3, placing them into the same folder as the originals. 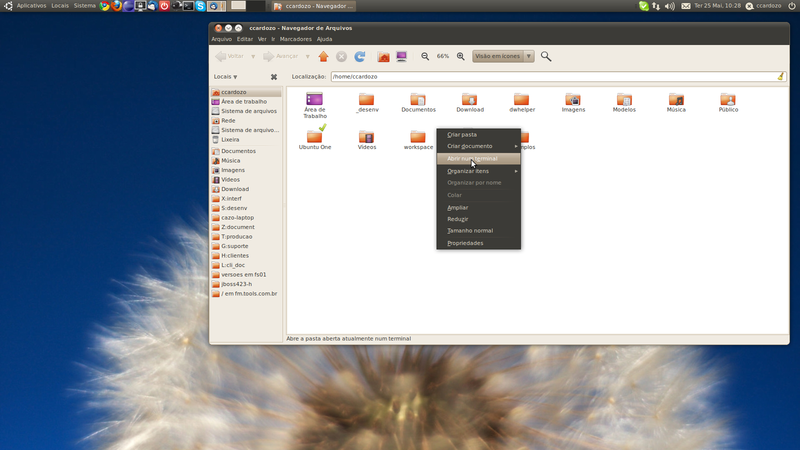 Foi lançada a nova versão do Ubuntu, 10.04 LTS – Lucid Lynx, com o Gnome 2.30.0.
a) Basta dar Ctrl + L — O Ctrl+L funciona, mas, a cada sessão aberta do Nautilus, têm-se que repetir esse comando. b) Pode-se fazer isso pelo Gconf-editor. Dê um Alt+F2, digite: gconf-editor. Abra (na “cruzinha”) apps, depois nautilus e, por último, preferences. Aí, é só marcar a opção “always_use_location_entry”. Pronto.